The Italian Dolomites hold a very special place in my heart. You've probably heard the term "the most beautiful mountains in the world" being said before many times about alpine regions; but to me, they are. 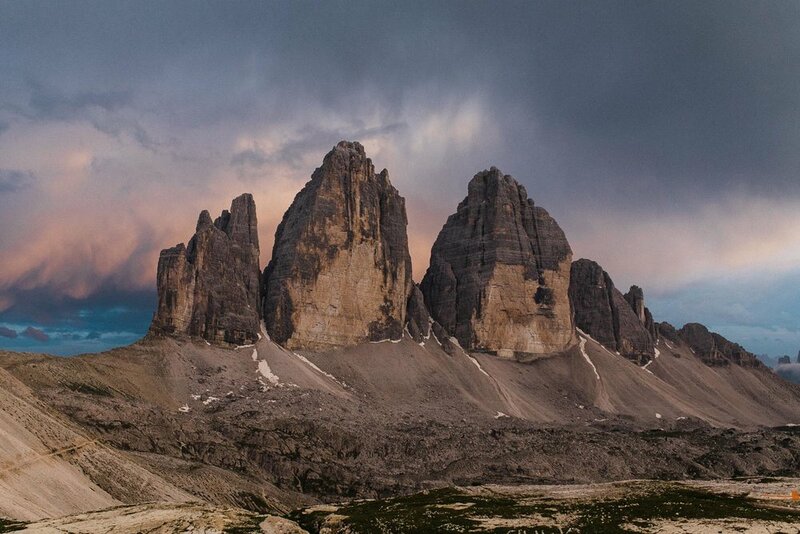 One of the, if not THE most iconic formations of the Dolomites are "Tre Cime di Lavaredo" (Drei Zinnen) right at the Border of the German speaking autonomous province South Tyrol and the Northern Italian province Belluno. 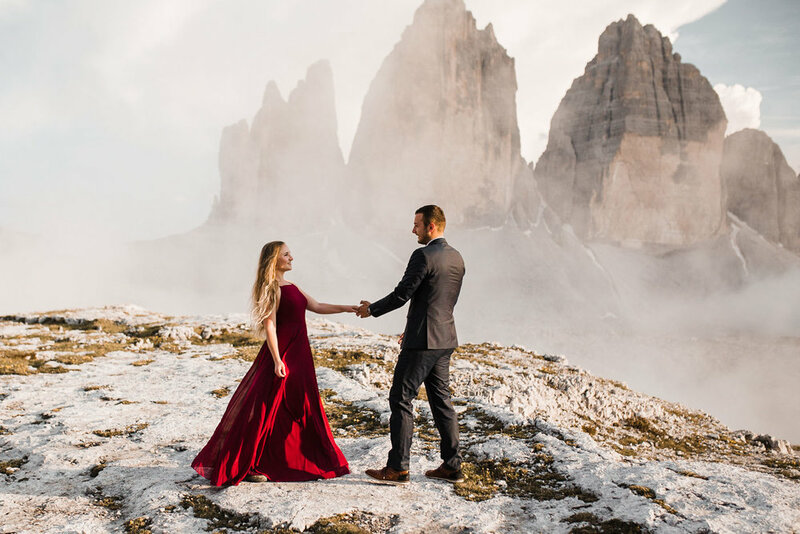 You will find countless images floating around the internet, but standing right in front of these massive exposed lime stone peaks, with the highest of them being "Cime Grande di Lavaredo" at 2999m, is something else. It's a humbling experience that never wears off. 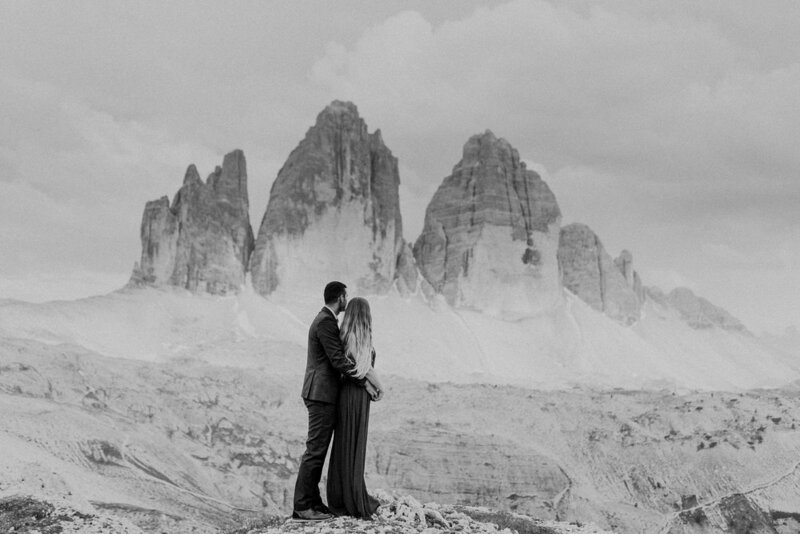 Not surprising that in 2009 it became Il Parco Naturale Tre Cime, an UNESCO World Heritage site. Having climbed the historic WWI ferrate around the area in a multi-day tour in 2014, I have always wanted to come back and photograph these impressive mountains properly. One of the most amazing things about doing a shoot high up there is the fact that you can't just drive by with your car. You need to plan for a hike and an overnight stay. 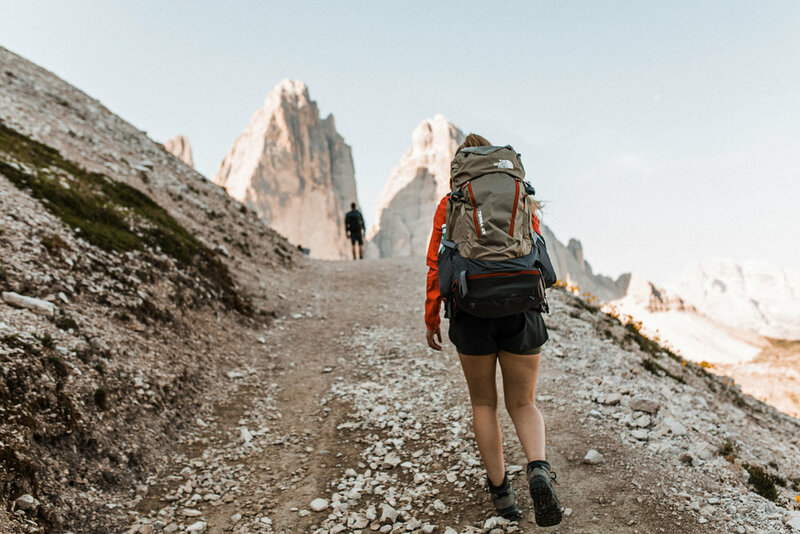 Since many trails from all different directions lead up to Rifugio Locatelli (Dreizinnenhütte), the base camp of Tre Cime, depending on which way you choose, it can be anything from a 1,5 hour to 5,5 hour hiking adventure - one way. 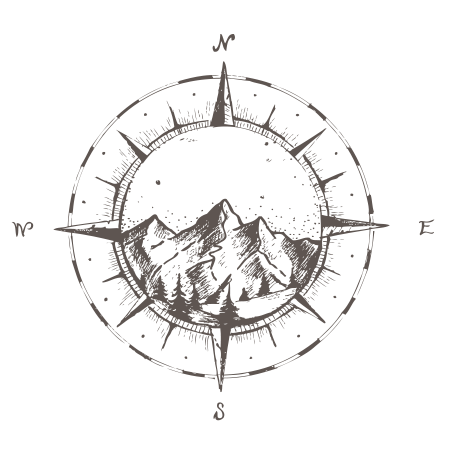 Staying overnight is an absolut MUST if you want to soak in the incredible atmosphere of sunset and sunrise, as well as the occasional, and often daily mighty thunderstorm that rolls through in summer and clears the air. It will give you the opportunity not only to avoid the masses of visitors during the day, but also to be present at the more quieter hours of dusk and dawn. 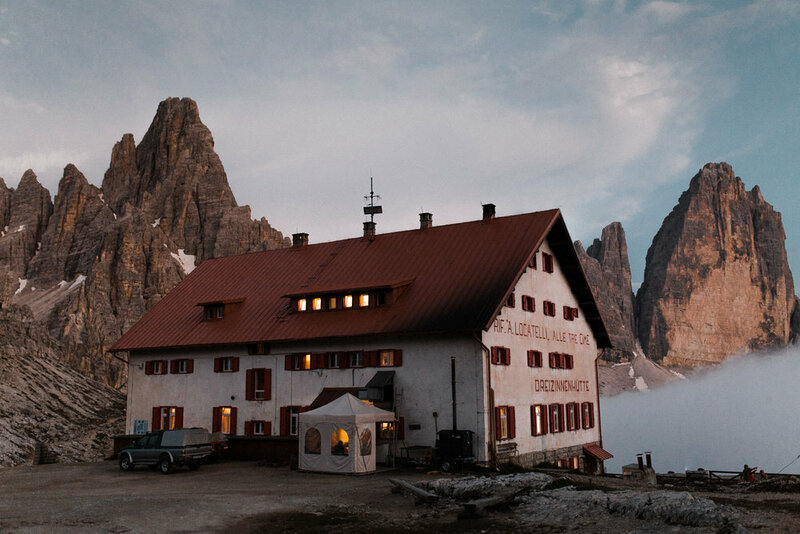 Walking a few steps away from Rifugio Locatelli, you will find solitude and peace. Watching the way the light plays and wraps around the towers at both times of the day, hidden by mist in one minute and dipped in golden light the next minute again is incredible to watch. After then sun goes down, the three towers glow in an otherwordly light. These are the moments when the world seems to stand still, and nothing else matters in the face of this wild, unyielding beauty. 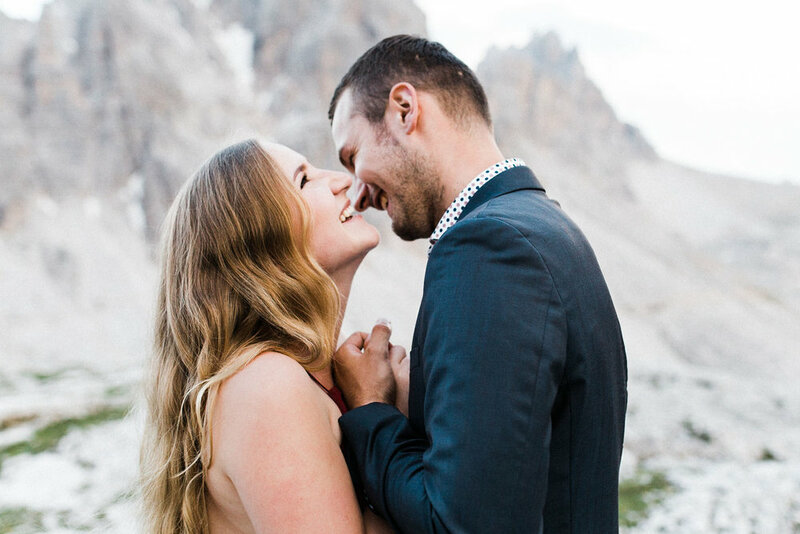 Noemi and Joël, a highly enthusiastic travel, adventurous and down-to-earth couple from Switzerland, were the perfect companions on this adventure. Having grown up hiking in the Swiss and Austrian Alpes during our childhood, we were all stoked for the ascent. Minutes before we went outside, the weather didn't look good. It was cloudy, dark and misty. Then suddenly, for some reason the miracle happend. 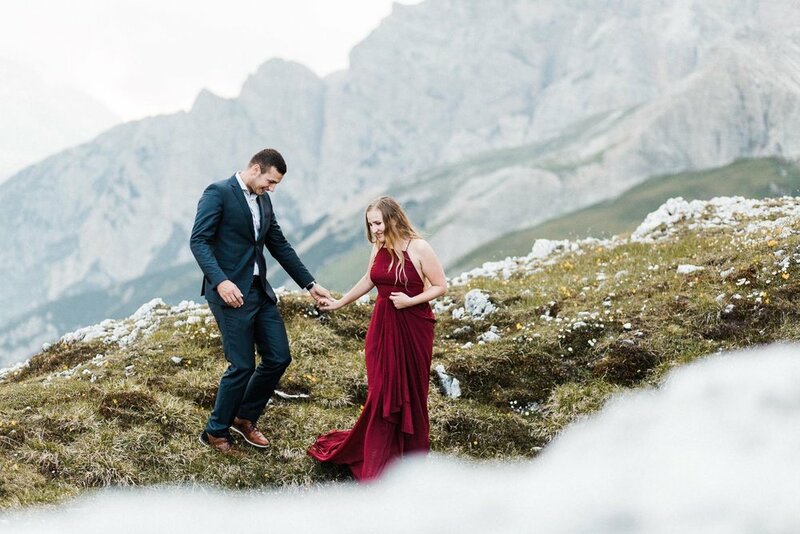 The mist retreated and gave way to the most amazing sunset view - every wedding and elopement photographer's dream. The weather in the mountains has its own ways, untamed, and will always be a risk. We know that we are only visitors of the wild and were lucky to experience this beautiful evening in great hights. The first part of the way back home all the way up to Paternsattel was reasonable quiet to hike, due to the early morning hours. Our advice: Make sure you get up super super early to watch the sunrise and enjoy the lonelyness for as long as you can. 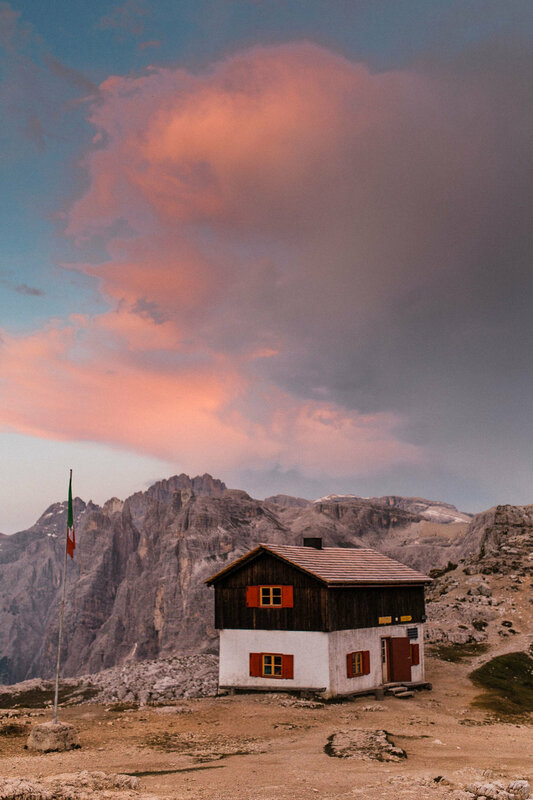 Reservations for Rifugio Locatelli, which is only open during a short period in the summer months, should be made 2-3 months in advance.